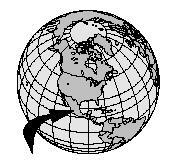 Mexico is located directly south of the United States. It is slightly less than three times the size of Texas. Two major mountain ranges run through the country's interior: the Sierra Madre Oriental on the east and the Sierra Madre Occidental on the west. Between the mountain chains lies the great central highland plateau. 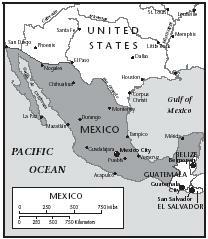 Mexico borders the Pacific Ocean to the west and the Gulf of Mexico and Caribbean Sea to the east. Mexico has a wide range of natural environments, but temperatures are generally mild year-round. The coastal plains and lower areas of southern Mexico are usually hot and humid. Mexico City, the country's capital, and other inland areas are at higher elevations and are generally drier. Annual rainfall may exceed 200 inches in the more tropical zones of the coastal areas, while parts of Baja California (a long, narrow peninsula located just south of California) receive very little precipitation. Desert-like conditions exist in the north. Although only about one-fifth of the country remains covered with vegetation, much of the country's wildlife are still in existence. Some animals include rabbits, snakes, monkeys, jaguars, anteaters, deer, toucans, parrots, and some tropical reptiles, such as the mighty boa constrictor. hunted, adding wild turkey, rabbit, deer, and quail to their vegetarian diet. When the Spanish explorers landed in Mexico, they introduced livestock, including cattle, sheep, pigs, goats, and chickens. On later journeys to this "New World," the Spanish brought plants from Asia, such as sugarcane and wheat. Spain ruled over Mexico for over 300 years. By the time Mexico gained its independence, Spain had left its mark on its people and culture, including their cuisine. Corn is the basis of the Mexican diet, as it has been for thousands of years. It can be found in almost every meal, usually in the form of the tortilla (flatbread). Corn can also be boiled to produce pozole , a hearty corn stew. Popular fruits and vegetables are tomatoes, tomatillos (green tomatoes), squash, sweet potato, avocado, mango, pineapple, papaya, and nopales (from the prickly pear cactus). Though beef is consumed, chicken and pork are more common. The variety of chilies includes the widely known jalapeño, as well as the poblano , serrano , and chipotle . Chilies give Mexican cooking a distinctive flavor, which is often enhanced with herbs, such as cilantro and thyme, and spices, including cumin, cinnamon, and cloves. Cheese and eggs round out the diet. Seafood is most common in coastal dishes. Though Mexican cuisine is a blend of indigenous (Indian) and Spanish influences, most Mexicans continue to eat more native foods, such as corn, beans, and peppers. Such foods are cheap and widely available. 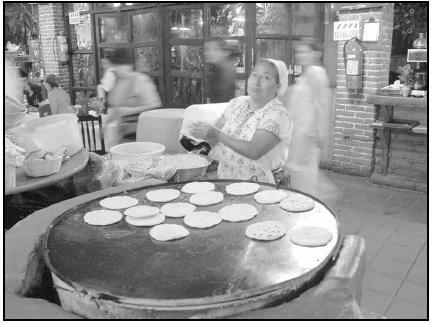 Bread and pastries are sold, but the tortilla, homemade or bought daily at the local tortillería (tortilla stand), is the basis of the typical meal. Flour tortillas are also eaten, especially in northern Mexico, but the corn variety is most popular. American soft drinks, such as Coca-Cola, have become popular in Mexico in recent decades, but fruit-flavored soda drinks are also widely consumed, as are fresh fruit juices, available from street vendors. Sangría , an import from Spain, and beer ( cerveza ) are also popular beverages. Coffee is normally served spiced and sweet ( café de olla ). 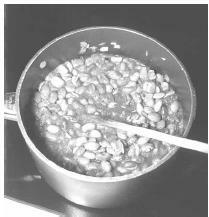 Frijoles are simmered over low heat until most the liquid has been absorbed and the beans and onion are soft. A pot of beans can be found simmering on the back burner in most Mexican kitchens. They may be eaten with any meal of the day, including breakfast. Place beans in a large pot and cover them with cold water. Allow them to soak overnight. When ready to cook, drain, rinse, and cover the beans again in cold water. Place the pot on the stove over medium to high heat and bring to a boil. Simmer 5 minutes. Turn off heat, remove the pot, and carefully drain the beans by pouring them into a colander placed in the kitchen sink. Rinse beans with cold water. Return beans to the pot and once again cover them with cold water. Add the onion, garlic, and chili powder. Cook over medium heat until most of the water has been absorbed and the onion is soft. Add salt to taste. Serve as a side dish with tacos, or as a main dish with warmed corn tortillas. Though refried beans can be bought in cans in the grocery store, homemade Frijoles Refritos (Refried Beans) are much more flavorful. In a large bowl, coarsely mash the Frijoles with a fork or wooden spoon. In a large frying pan or skillet, heat the oil for about 30 seconds over medium to high heat. Add onion and sauté for 5 minutes, until onion is golden but not browned. Add the mashed beans and cook for about 5 minutes, stirring often. Salt to taste. Scoop the beans onto a warmed corn tortilla, and add a bit of shredded cheese (such as Monterrey Jack or mild cheddar). During the centuries of Spanish rule over Mexico, the majority of Mexicans were forced to convert to Christianity. Christian holidays, including Nochebuena (Christmas Eve) and Navidad (Christmas), are celebrated with great enjoyment and family meals. Many festivities include native Indian traditions. During Semana Santa (Holy Week) leading up to Easter, meat is typically not consumed. Día de los Tres Reyes (Three Kings Day or Epiphany) on January 6 and Día de los Muertos (Day of the Dead) on October 30 are occasions for more celebration, including the consumption of specific foods. On Día de los Tres Reyes, a special sweet bread, Rosca de Reyes, is eaten. A typical menu for Día de los Muertos, during which Mexicans decorate and picnic on the graves of their dead relatives, includes empanadas (meat-filled turnovers, an import from Spain) and tamales (steamed corn husks with various fillings, including shredded pork). Also included are chicken or turkey with mole (pronounced MO-lay, it is a distinctive sauce combining chocolate, chilies, and spices), pan de muertos (a sweet bread, baked in a ring and with a tiny plastic skeleton hidden inside), and calaveras de azucar (sugar candy skulls, bought at candy stores). On each of the eight nights before Christmas, friends and neighbors travel from house to house, stopping at selected houses to sing or recite lines, asking for lodging. At the last door, they are welcomed inside for festivities, including the breaking of the piñata , a papier-mâché animal filled with candies. Other typical foods during this time include buñuelos (thin, fried pastries, covered in sugar) and ponche (fruit punch). Many Mexicans buy tortillas made fresh daily at the local tortillería (tortilla stand). Corn tortillas are the basis for most typical meals. Flour tortillas are also eaten, especially in northern Mexico, but the corn variety is most popular. This is a truly Mexican version of the traditional Spanish bread. Make the dough: Crumble the yeast into the warm water and set aside. In a large mixing bowl, mix together sugar, cinnamon, and butter. Add the eggs, mixing thoroughly. Slowly add the flour, a little at a time, until the dough is smooth and stretchy. On a large baking sheet, shape the dough into a ring, pressing the ends together to make a full circle. Cover the ring with a clean cloth or dish-towel and let sit in a warm place (to rise) for 2 hours. Preheat oven to 350°F just before baking. Make the paste : Mix together the butter and sugar, add in the egg, and gradually mix in flour. This paste can be used to decorate the top of the cake once it has risen but before it is baked. The typical decoration is rays that come out from the center. Candied fruits may be pressed into the cake before baking. Bake 30 to 40 minutes, until cake is golden brown. A Mexican desayuno (breakfast) usually includes coffee and pan dulce (sweet rolls), though eggs are also eaten on occasion. Huevos rancheros , served with tortillas and beans, is also a popular breakfast dish. Comida (lunch), the main meal of the day, is eaten between 1 and 3 P.M. It may consist of soup, a meat dish, rice, tortillas, coffee, and dessert. Cena , supper, is typically a light meal eaten after 9 p.m. However, in Mexico City and other urban areas, dinner can be an elaborate meal, eaten in one of many restaurants. In a skillet, heat oil (about ½-inch deep) over medium to high heat. Add 1 tortilla at a time and fry each for about 5 seconds until softened but not crisp. Place on paper towels to drain. Heat a small amount of vegetable oil in a large skillet over medium to high heat; break the 4 eggs into the skillet and fry them, 2 to 3 minutes per side (or until the whites are cooked and the yolk is no longer runny). Place a tortilla on each of 4 dinner plates, topping each tortilla with a fried egg. Pour ½ cup of salsa over each egg and top with ¼ cup cheese and a few slices of avocado. Snacks are called antojitos (literally, "little whims") and are eaten at any time of the day. An antojito might be a beefsteak taco, a tostada (a fried, flat tortilla, often topped with chopped tomatoes, onion, lettuce, and cilantro), or a sope (a lightly grilled corn dough, often served with salsa or beans). A schoolchild's lunch may consist of a torta (a sandwich of cheese, avocado, and sausage, or chicken on a bread roll) or a quesadilla (a folded flour tortilla filled with melted cheese). Street vendors sell slices of pineapple, jicama (a sweet root vegetable) with a wedge of lime, and elotes (steamed corn on the cob served with butter and shredded cheese). Ice cream and fruit ices are popular as well. Though American fast food has entered Mexican diet, street stands and market stalls continue to make and sell traditional Mexican foods. 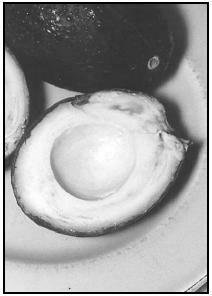 The creamy flesh of half an avocado will be cut into small cubes for Pico de Gallo (Mexican Salsa). 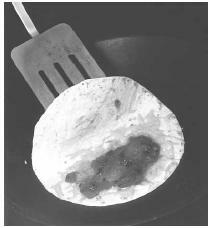 The tortilla, topped with shredded cheese and a heaping spoonful of Pico de Gallo (salsa), is heated in a dry skillet. Lift the edge of the tortilla to check on its progress. 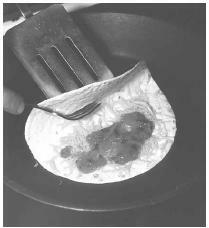 When the underside of the tortilla is golden in color, fold it in half to form an envelope and cook for another minute to allow the cheese to melt completely. Place a frying pan on medium to low heat. Put first tortilla in (oil should not be used!) and sprinkle half the cheese and a spoonful of salsa onto ½ of the tortilla. 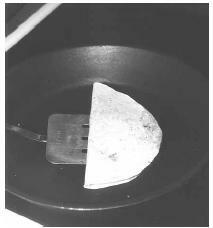 When the cheese begins to melt, use a spatula to fold the other half of the tortilla over top, making an envelope. The tortilla should turn golden, but should not brown; turn down the heat, if necessary. Let cook about 1 minute, to allow the cheese to completely melt. Remove to a plate and repeat, using the second tortilla. One quesadilla per person is enough as a snack, but two might be served as the main course for lunch or as a light supper. supporting the prices of agricultural products. Mexico is self-sufficient in most fruits and vegetables (that is, Mexican farmers grow enough to meet the needs of the people), and in beans, rice, and sugar. However, many people living in rural areas are poor, and are barely able to grow enough food to feed their own families. Technically a sopa seca, or dry soup, this dish is often served before the main course. In large skillet, heat oil over medium heat for about 1 minute. Add the onion and garlic and cook until the onion is golden but not brown. Add rice and mix ingredients together well. Cook rice for about 5 minutes. Add broth and reduce heat to low. Cover and simmer 15 to 20 minutes, stirring occasionally. Serve the rice when all the liquid has been absorbed. Slowly melt the chocolate in a small saucepan over low heat. In another small saucepan, warm the milk, cinnamon, vanilla, brown sugar, and cinnamon sticks together. Pour the warmed milk mixture into the melted chocolate and stir to combine. Remove the cinnamon sticks and pour hot chocolate into two mugs. Children as young as 14 may work, but there are strict laws about the conditions and hours of employment. However, young people working on farms are often working for their family, so the laws are not enforced. Most children in Mexico receive adequate nutrition, although there is a small percentage of very poor children whose diets lack basic nutrients. Coronado, Rosa. Cooking the Mexican Way. Minneapolis: Lerner Publications, 1989. Geddes, Bruce, and Paloma Garcia. Lonely Planet World Food: Mexico. Victoria, Australia: Lonely Planet Publications, 2000. Illsley, Linda. A Taste of Mexico. New York: Thomson Learning, 1994. Lasky, Kathryn. Days of the Dead. New York: Hyperion Press, 1996. Lonely Planet Online. [Online] Available www.lonelyplanet.com/destinations/north_america/mexico/ (accessed February 19, 2001). QueRico. [Online] Available www.querico.com (online grocer for authentic Mexican ingredients and foodstuffs) (accessed February 2, 2001).